Other volumes in the Wiley Series in Probability and MathematicalStatistics, Ralph A. Bradley, J. Stuart Hunter, David G. Kendall,& Geoffrey S. Watson, Advisory Editors Statistical Models inApplied Science Karl V. Bury Of direct interest to engineers andapplied scientists, this book presents general principles ofstatistics and specific distribution methods and models. Prominentdistribution properties and methods that are useful over a widerange of applications are covered in detail. The strengths andweaknesses of the distributional models are fully described, givingthe reader a firm, intuitive approach to the selection of the modelmost appropriate to the problem at hand. 1975 656 pp. FittingEquations To Data Computer Analysis of Multifactor Data forScientists and Engineers Cuthbert Daniel & Fred S. Wood Withthe assistance of John W. Gorman The purpose of this book is tohelp the serious data analyst, scientist, or engineer with acomputer to: recognize the strengths and limitations of his data;test the assumptions implicit in the least squares methods used tofit the data; select appropriate forms of the variables; judgewhich combinations of variables are most influential; and state theconditions under which the fitted equations are applicable.Throughout, mathematics is kept at the level of college algebra.1971 342 pp. Methods for Statistical Analysis of Reliability AndLife Data Nancy R. Mann, Ray E. Schafer & Nozer D. SingpurwallaThis book introduces failure models commonly used in reliabilityanalysis, and presents the most useful methods for analyzing thelife data of these models. Highlights include: material onaccelerated life testing; a comprehensive treatment of estimationand hypothesis testing; a critical survey of methods forsystem-reliability confidence bonds; and methods for simulation oflife data and for testing fit. 1974 564 pp. 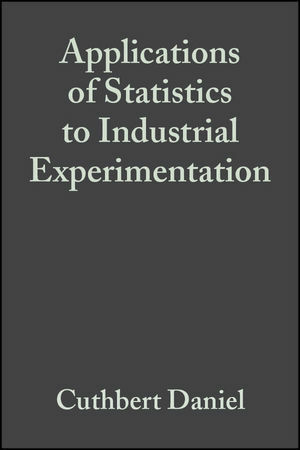 About the Author Cuthbert Daniel, Consultant in Engineering Statistics, earned his B.S. and M.S. degrees in Chemical Engineering at the Massachusetts Institute of Technology, studying further at the University of Berlin in 1928 and at Harvard University, 1930-31. He has taught courses in design of experiments and industrial statistics at Columbia University and at the University of California, Berkeley. In the mid-40's he worked as a Statistician at the Gaseous Diffusion Plant, Manhattan Project, Oak Ridge, Tennessee. Mr. Daniel has served as a consultant in statistics to the Research and Development Departments of several large corporations, including Procter and Gamble, United States Steel, General Foods, Interchemical, Standard Oil (Indiana), and Okonite. Mr. Daniel has been a consultant on design of experiments and analysis of engineering data to the Office of Air Polution, and to the Consumers Union. He was a member of Cancer Clinical Investigations Review Committee of NCI, and of NAS/NRC Committee on National Statistics. He is author (with F. S. Wood) of Fitting Equations to Data: Computer Analysis of Multifactor Data for Scientists And Engineers, published by Wiley-Interscience in 1971. Two Factors, Each at Two Levels. Two Factors, Each at Three Levels. Three Five-Factor, Two-Level Unreplicated Experiments. The Size of Industrial Experiments.